Meet Bacardi and JB – they consider each other their Best Friend Forever. They play together, groom each other, hang out together and sleep together. Bacardi is the more talkative of the two. They both love to chase after the moving little red spot produced by those popular “Pet Laser” lights. Both cats are about 3 years old.Â Bacardi is a dilute peach-grey torbie girl, JB is a typical brown tabby boy.Â They were rescued from a hoarder situation in Baton Rouge, LA, in 2007. Both cats get along with other cats and dogs that don’t act agressively towards them. When they want attention, they will come seeking it, but they are not lap cats. 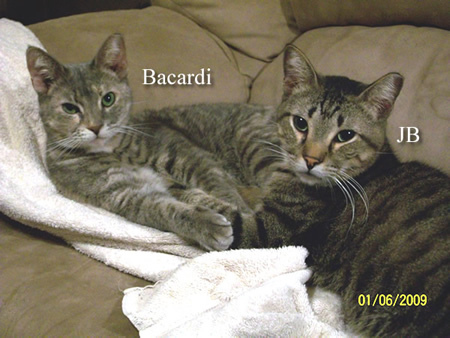 We’d like to see Bacardi and JB be adopted together to the right person/home that understands cats. We are offering them at a special 2-for-1 adoption fee. 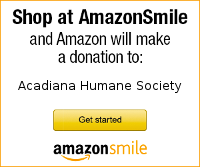 If you’re interested in Bacardi and JB, email info@acadianahumane.org or call (337) 668-4484.